Remap volunteers Brian and Agnes Wallwork got to work, using an existing small bed as the starting point and fitting a door at the end for an entrance. The “lorry-bed” features a lot of details such as an exterior mirror, headlamps, radiator and number plate. Inside the cab there’s a steering wheel, speedometer, oil and temperature gauges and ten sounds can be played. No surprisingly, young Caedmon is enthusiastic about his bed and climbs in and out by himself. 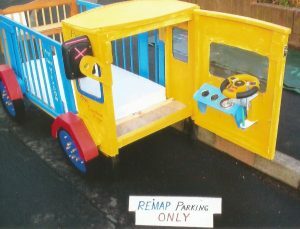 The Remap volunteers enjoyed working with the family who all helped with the project along the way.